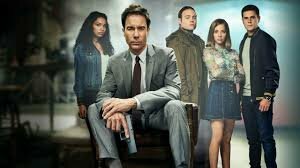 Travelers is a co-production tv series between Netflix and Showcase (A Canadian TV network). The show stars are Eric McCormack, Mackenzie Porter, Jared Abrahamson, Nesta Cooper, Reilly Dolman, and Patrick Gilmore. This show first aired in Canada in October of 2016, and debut the globally on Netflix in December of 2016. The show kept this same time frame in 2017 for season 2. The premise of the show is that in post-apocalyptic future hundreds of years from now, thousands of operatives ( aka travelers) how been sent back to stop the events that trigged the collapse of society. The time travel aspect is not a physical concept but is their Consciousness that is sent back in time into the body of a host. The host is chosen through surviving records from a variety of Internet sources and data that has been stored. They are uploaded into the host moments before their time of death. After the Consciousness has been downloaded to the host, they resume the lives of individuals who were about to die. They are grouped in teams and they follow the orders of the director. The director is the leader, of what is left of humankind and also the mastermind behind what they call the grand plan to save human civilization. So that is the overarching story, but what really makes this show good in my opinion is dealing with the fallout of assuming someone else’s life, and all the day to day problems that go along with that. You have people from the distant future that have been living on brink of extinction and now dealing with problems that in there world were not problems. For instance, one traveler got sent back to the body of a mother who was about to be killed by an abusive boyfriend and on top that she also has an infant son to deal with as well. So you have people who are dealing with the burden of trying to change the future for the better while also dealing with problems that don’t exist in there time, mostly because everyone is trying to survive. With that being said don’t think there is a complete unity of purpose with all the travelers because you have those from future who do not follow the director’s plan and have a different way to preserve the future. So this makes for some good plot twist and keeps the show fresh. I personally fell in love with this show after the first episode of season 1 and I binged watched season 1 and it left me wanting more. It was a long wait for season 2, and it was worth it. But like many things in life this show is a cruel mistress, it ended with a bang and that led to that I can’t wait for the next season excitement. Then it hits you, and realize you have to set out on that year-long ordeal of waiting yet again, and if the two previous seasons are any indicator it will be worth it.